This is a long standing pet-peeve of mine. I love getting email from my friends and colleagues, but how much of the content has meaningful value? Depending on where you work and your company's policies, that message exchange could be predominantly an exchange of email signature blocks. If your friend was not a colleague, then your email interplay probably included a confidentiality notice and a note to say that the message had been virus checked - each time it went backwards and forwards! I did a back-of-a-matchbook calculation and estimate that as little as 2-12% of the kinds of emails is information of value - the semantic content. Just think of the digital trees that are being wasted and the pointless whizzing of elections around the ether and the megabytes of data that are lounging around on hard drives adding no value. For more formal communications, that may still need to be printed to hard copy and stored, then that redundant information is going to use up real trees. Move this stuff completely away from email. Use a chat program or text messaging for this sort of stuff! iMessage, Slack, Skype, WhatsApp or plain old SMS. I favour applications such as iMessage, Slack and Skype as I can use my computer, tablet or phone to write or respond to messages. My old eyes and fat fingers mean that I am not so fast on the keyboard of a phone any more. There are loads of other chat programs out there. Keep it short. Real short. Maybe include a link to your Web site where your correspondent can get further information about your inside leg measurement. Don't include graphic images such as your logo. Why do we want millions of those little .jpg files doing nothing but wasting space? If you must present your brand image, you could write a smart looking email signature block using CSS (or get someone to do it for you), that links to your logo hosted on your Web site. It will still appear in the email, but won't be stored in every email message that you keep. Do you have to automatically include your signature block every time you send a new message? If the message is an internal message and all recipients know who you are.......then maybe not. Do you have to automatically include your signature block every time you reply to a message? Consider switching that off in your email program. Use your signature if you are forwarding something on to someone you don't know well or at all. You may have no choice about including this, as it might automatically by added by your email server to all messages leaving the company. In the UK and Germany it is a requirement to include certain information about the company and/or it's directors in outgoing email. I don't believe this is required for internal email. If you have to have one - see if you can get the company to make it as short as possible. I mean, really figure out whether every single word in the text is absolutely necessary. Treat it like a précis exercise and come up with the shortest notice that includes the necessary semantic content, complies with your local requirements and that reads well. For UK registered companies I have seen these notices ranging from ~200 characters and ~30 words to 1300+ characters and 220+ words. Of course your email service checks incoming and outgoing emails! You wouldn't use it otherwise would you? I don't need to know about it. I assume you do this. This is not the 1990s anymore. I have seen these statements ranging from ~50 characters and 5 words to ~300 characters and 20 words. Again, your company may add these notices automatically to outgoing messages, and if they insist, ask them to hack the word count to the minimum. I guess one reason that we just send this mostly valueless information to each other again and again, is that it takes a little thought and energy to decide not to. I think that the brain cells you excite to manage this process will be well used if you can reduce the amount of wasted content that we relentlessly send to each other on a daily basis. So my plea is: Email signatures. Stop it. Now. My requirements are fairly modest - the documents I need to write for my consulting work are usually proposals and reports. They might include a Table of Contents, a simple table or two, perhaps a graph, some images and a few citations. Above all, my work does need to look professional. I am not authoring a book or technical manual nor am I writing up a PhD thesis. I don't need to include many complex tables and figures or a detailed bibliography. I am trying to build a workflow that is intuitive to me, that allows me to focus on content, and one where I do not have to worry about files getting lost or corrupted. I start off by writing all notes (and eventually full reports) in a fast 'database' application for the Mac - nvALT. As well as being a text editor, it stores them, and allows lightening fast searches. It is also very 'keyboard friendly' meaning I don't have to move my hands away from the keyboard to use the mouse a lot - my typing is slow enough as it is! I save the files as plain text, a truly portable file format that is cross platform and more likely to be future proof than a Word .docx file. The text I write is styled using Markdown, an easy to use set of conventions for marking up text that allows the creation of rich content. This article and the entire blog and Web site is written in Markdown. To see the source, take a look at the .pdf file attached to this article. As well as being a database and a plain text editor that is good for writing Markdown, nvALT supports external editors such as Byword and iA Writer. This means I can seamlessly switch between my chosen editor and nvALT. I tend to use Byword for bashing out the words because it presents a simple user interface that minimises distractions and then save it back to nvALT which is the 'bucket' or home of most of my content. Increasingly now, I also save a copy of the final plain text file in the project folder with a .md file extension. There is a risk here that the text in my nvALT database will diverge from the Markdown file I have saved in the project folder if I am not careful. My assumption is that the version that I put in the project folder is the one that was used to create the .pdf that was the deliverable to my client. I have configured nvALT to save the plain text files to Dropbox. It stores all my work files and syncs them across all my computing devices. Dropbox provides up to 2GB free. Dropbox (well certainly the paid plan anyway) supports versioning - so if I needed to revert to an older version of my file, I can do that. nvALT is also set to Sync with Simplenote in case I want to edit my notes on my iPad or (less likely) my iPhone. This is something that could be a lifesaver were my laptop to die and I have to fall back on my iPad as a contingency measure. Simplenote is Free. Premium accounts are available. Coincidentally, Simplenote also supports versioning, so together with Dropbox's versioning, I have a belt and braces solution to recovering earlier drafts of a piece of work. I use Marked for formatting for print and all my output is converted to .pdf. Output can be styled using Cascading Style Sheets (CSS) - there are some templates out there, but I might need to take the plunge and get hands on with CSS in order to get the look and feel I want. TextExpander is optional software that can help automate your writing and improve productivity. If you find yourself using a phrase or expression regularly, then consider making it into a 'snippet' that you trigger with a keyboard abbreviation. For example, I use the abbreviation .copy to fill the phrase © Alwyn Consulting %Y into any document that I am writing in any application. TextExpander automatically substitutes the year for %Y to produce "© Alwyn Consulting 2014". TextExpander is capable of creating very complex snippets incorporating dates, times, calculated dates and single line, multi-line, pop-up and optional fill-ins. Using Dropbox, you can sync your snippets across all your computers and your mobile devices too. If you are looking for consistency and efficiency, it is something worth looking into. I have described 10 services, applications, conventions and languages that I may use just for writing. Couldn't I just use Word? But I find it very annoying and it crashes repeatedly - and it's Word! I have used Apple's Pages in the past too - and that is not without it's issues. I have a way to go with my writing workflow requirements but I think I can see light at the end of tunnel. I plan to build some templates that incorporate my 'house style' and perhaps use TextExpander to deploy them. The question is, can I manage do it all using just MultiMarkdown and CSS or will I have to go down the route of incorporating the LaTeX typesetting system into my workflow? I gave a short presentation to a group of clinical researchers back in November 2012 on technologies and tools that might suit freelancers. I've updated it and have included it here (download PDF, 9.7 MB). The PDF includes hyperlinks to most of the resources and software mentioned (just click the product name). If anyone is curious, I used a new application called Deckset when doing the update to the presentation. It was originally written in Keynote, Apple's version of PowerPoint. It converts plain text, styled in Markdown, and your selected images into nice looking slides. There are no fancy animations or transitions, just neat typography and a simple style. It's forcing me to keep my messaging as clean as possible. Keynote speech by David Heinemeier Hansson at RailsConf 2014. He proposes an alternative to the engineering driven holy grail of Coverage, Ratio and Speed metrics for testing and believes the objective should be clarity of the codebase. DHH is a partner at Basecamp and creator of Ruby on Rails - the open source web framework that (amongst others) Twitter is built on. Warning: some 'plain language' in this presentation. David's presentation was written in Markdown and displayed using Deckset. Daffodil, taken by the author, March 2008. For those of you not on distribution and wanting to take a peek - click here. You can subsribe on my Contact page. Very nice looking wireless ECG transmitter about the size of a box of matches. 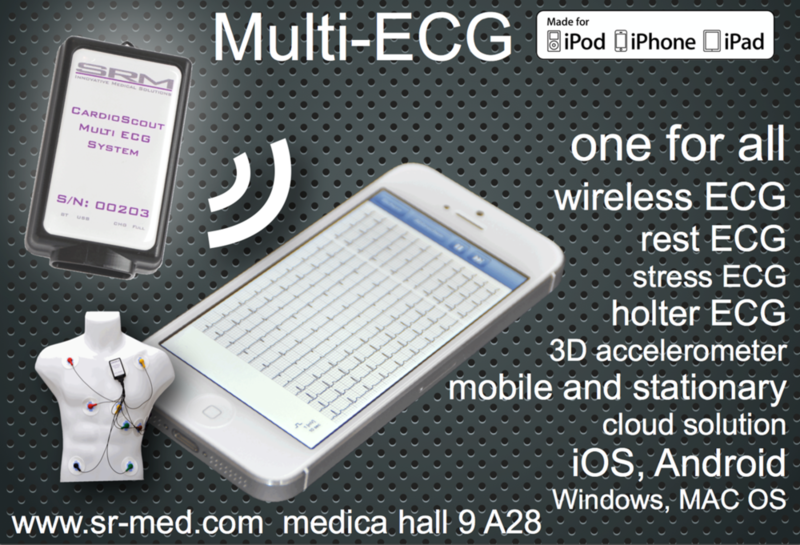 According to the manufacturer (SR-Medizinelektronik), the CardioScout Multi-ECG is capable of 12-lead resting ECG, stress ECG and Holter monitoring. Good to see this sort of technology with viewing and analysis options now available on iOS (iPhones and iPads) and OSX (Macs) as well as Android and Windows. Would love to hear from experts whether it would be suitable for use in clinical trials and submissions to regulatory authorities. Seems it might be a low cost option for Thorough QT/QTc Studies (link to FDA guidance PDF) amongst other more conventional ECG applications. I had the privilege of working on this latest issue of CRfocus as one of two guest editors. We burnt a fair bit of midnight oil. For myself, this is my first effort at putting together a magazine, so don't be too hard on us! We built this release using Word - not my favourite software package - and might take a look at Scribus, a cross platform open source desktop publishing package, for later issues. Click on the image to take you through to the Institute of clinical Research Web site so you can download it. ICR is aiming to get these out on a quarterly basis for the forseeable future. Would love to have your feedback on layout, content etc. Thanks to my co-Guest Editor, Edgar Smeets - an unstoppable machine with drive and determination, the ICR Editorial Board for letting me loose on their magazine and all the contributors. I am looking for a Learning Management System for SMEs and discovered Docebo. Does anyone have any experience or other suggestions? Prefer a cloud-based solution and am interested in the emerging Tincan or experience API. I have been working on a contract for a not-for-profit for the last 2-3 weeks and have been setting up a Customer Relationship Management (CRM) system for them to help with managing their grant application process. I selected Highrise from 37Signals as I have had some experience using it and most of the other products from the 37Signals stable over the last few years. It's lightweight, easy to use and quick to set up. Importantly it integrates nicely with desktop email clients and address books and the learning curve is fairly shallow. As with most new technology implementations it takes discipline and commitment to get it off the ground. At the same time as introducing the new technology I am creating and honing a complete set of business processes by doing the job myself. The challenge remains to help the organisation switch from sending spreadsheets around by email to a cloud based database platform. What makes it rewarding, is seeing successful take up and buy-in from a largely unpaid team of volunteers spread about the globe. Just for the record - no connection to 37Signals. There was a piece on Radio 4's 'Thinking Allowed' yesterday in an interview with Professor Adam Hedgecoe about 'normalisation' of practice. 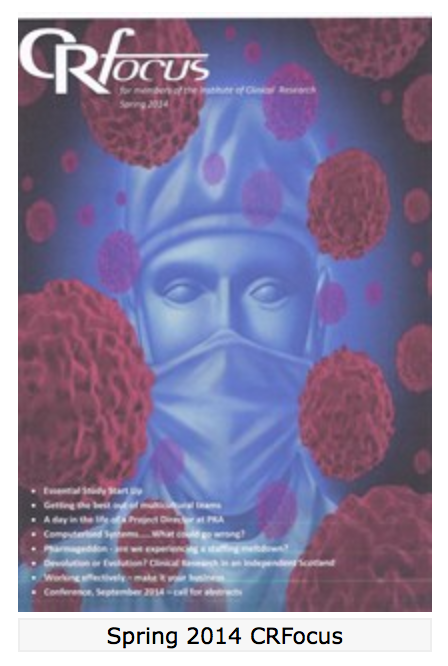 He describes how it had become normal to dose subjects in clinical trials of new medicines at fairly short intervals. After the extremely serious adverse events experienced by the volunteers that participated in the trial there was a lot of hoopla by 'experts' stating that short dosing intervals were wrong and inappropriate. The fact is, that everybody did it this way. It goes without saying that the more cautious approach that we take today is better. It was good to hear an interview that didn't seek to sensationalise the story. I've heard this expression in reference to software development a few times and never really knew what it meant. It comes from an approach developed by Lockheed (and particularly one of it's engineers - Clarence 'Kelly' Johnson) used to build it's first jet fighter ahead of schedule and on budget. Johnson pulled together a small, specialist team within the larger organisation and 'flew under the radar' cutting red tape and just getting things done. 37Signals.com have written about it with respect to a philosophy of design. 'Quick prototypes. Small teams. No bureaucracy. No lengthy documentation. Limited meetings'. It fits in with the key themes of their two books - Getting Real and Rework. So now I know, and can aspire. Diclofenac kills 99.9% of all known.....vultures? This is not new (e.g. National Geographic, 2004), and I heard it again last night on a Radio 4 programme - Saving Species - vets in India, Pakistan and Nepal prescribe the common anti-inflammatory to cattle, some of these animals die, the birds eat the carcasses that contain diclofenac residue which affects their kidneys and they get visceral gout and die. Since the mid 90's the population of three species of vultures has dropped from about 40 million to just a few thousand today - decimating the numbers of the Indian White-rumped Vulture (Gyps bengalensis), long-billed vulture (Gyps indicus), and slender-billed vulture (Gyps tenuirostris) by more than 99.9%. What's the effect - nobody around to clean up carcasses leading to a proliferation in packs of feral dogs and increased possibilities for spreading rabies. It's amazing how easy it is for us to spin our ecology off it's axis. Let's hope we can fix it. medicexchange.com reports that Nextrials showed off their new iPad app to access their data management technology - Prism™ - a fully integrated clinical trial management and EDC product - at the recent DIA meeting in Washington. Reportedly the app will also be available for the iPhone when it is made available this year. Good work from a company that seems to be striving to get its arms around extracting data from EHR and EMR systems used by healthcare providers (Mar 2009) and making their product compatible with both the iPad's Safari (April 2010) and Google's Chrome (May 2010) browsers. that support Agile development, integrate with Google Apps + Studio and Sharepoint and have a wide range of customers from Adobe, BMW, and Boeing to Johns Hopkins University and Yahoo! I like the look of their issue tracking and project management tools in their JIRA product. In yesterday's post I reported what Dan Pink believes drives people. In his video he cited Atlassian's novel approach to providing autonomy and engagement. Once a quarter the firm gives it's employees beer and cakes and 24 hours to work on any of the products they have in the software portfolio so long as they show the output of their work at the end. This 'let me get out of your way approach' by management results in significant bug fixes and innovations to their product line. ....and what motivates us is autonomy, mastery and purpose. According to a talk given by Dan Pink at the Royal Society for the encouragement of Arts, Manufactures [ sic ] and Commerce (RSA). Paraphrasing Pink, employees want to have an overall purpose and when the profit motive is unhitched from the purpose motive 'bad' things can happen. I had most experience and understanding of this point. He states that people want to feel that they are making a contribution. I was quite enthralled with his thoughts on autonomy and mastery. He states you can expect better engagement with more autonomy. Makes sense. Employers should get out of the way of their employees. I have been conscious of this but in a different way - maybe we used to call this 'empowerment'? And mastery - it's obvious really. He cites the case of people spending hours of their free time learning the guitar. You do it, because it's fun, because it's a challenge and because you get better at it. Microsoft shares shed 4.07 percent on Wednesday to close at 25.01 dollars, dropping its market capitalisation -- the number of shares outstanding multiplied by the stock price -- to 219.18 billion dollars. Apple shares lost 0.45 percent meanwhile to close at 244.05 dollars, giving the company a market value of 222.07 billion dollars. Well that's good to hear and vindicates a decision to use barcoding made long ago by companies like PAREXEL with it's ClinBase® bedside data capture and trial management system designed for early phase trials. There's always a lot of talk about reducing costs and saving time to database lock with these kinds of true EDC systems, but compliance management in the clinic is just as important to consider if you step back and take the helicopter view. Thanks to Wm. J. Martin over at LinkedIn's EDC-Clinical Trials group for posting the link.